British atmosphere, with references to the world of horses and high altitude, with tartan red, high-heeled shoes that resemble mountain boots and complete that combine feminine and masculine with determination. With the motto "Plus ça change, plus c'est la même chose" Rossella Jardini, door on the catwalk throughout the herirage of the maison but reinterpreted with curiosity and humor. Here is the fashion show fall-winter Moschino, inspired by the elegance of Ann Taylor Bonfoey, independent woman and a feminist, a great lover of horse riding and skiing. 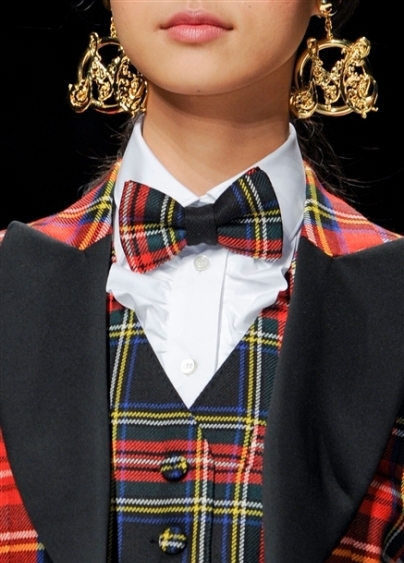 Starting from the tartan and the combination of colors that includes Moschino features as fashion trend for autumn winter 2013/2014: is scottish-mania with plaids in red base, embroidered with gold insignia, hats Scotland Yard and the combination of black and white. The clothes are chosen collegial style or men in contamination of genres and fashion trends: suit for men revisited with cigarette pants worn with white shirts and rigorous classic cut, uniforms such as those worn by the girls in Japanese schools, clothes taken from the world of 'riding. Atmosfera british, con richiami al mondo dei cavalli e dell'alta quota, con tartan rosso, scarpe con il tacco che ricordano gli scarponcini da montagna e completi che uniscono femminile e maschile con determinazione. Con il motto “plus ça change, plus c’est la même chose”, Rossella Jardini, porta in passerella tutta l’herirage della maison ma reinterpretata con curiosità e ironia. Ecco la sfilata autunno-inverno di Moschino, ispirata dall'eleganza di Ann Bonfoey Taylor, donna indipendente e femminista, grande appassionata di equitazione e di sci. 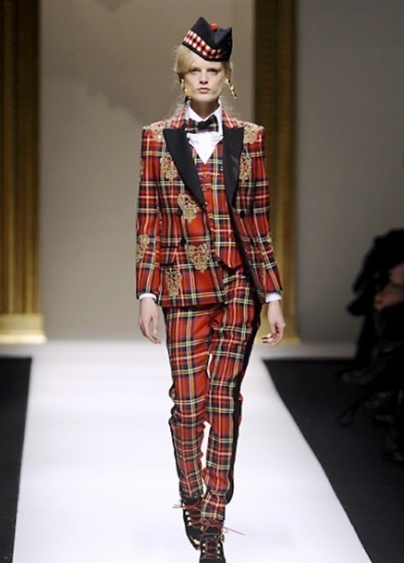 Partendo dal tartan e dalla combinazione dei colori si comprende ciò che Moschino propone come tendenza moda per la stagione autunno inverno 2013/2014: è scottish-mania con con i tessuti scozzesi a base rossa, le mostrine ricamate d'oro, i cappelli di Scotland Yard e la combinazione black and white. Mi piace molto l'uso che ha fatto del tartan!! 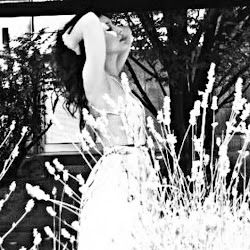 Adoro Moschino (; Reb, xoxo. Mi piace molto il tartan e il taglio dei cappotti!! That is such a pretty selection!!! I want all of these outfits!